Jamie’s Italian seems to divide the masses. I know people who rave about the chilled back “kick back with friends over good food” atmosphere, and I know others who simply aren’t wowed. I’ve been there I get it, when you’re paying for a £14 burger (with chips, that’s right….you pay extra for those….£3 extra) and your sat in a celebrity chef’s restaurant you are expecting to be wowed, but somehow there is a part of you that is more than aware of the sole reason that burger is £14; the brand of ‘Jamie’. That’s why I’m here to tell you about the Gold Club. 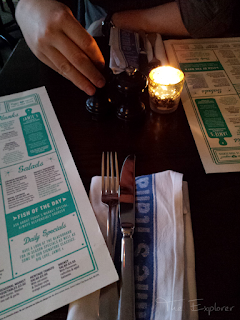 On Saturday Mr M and I were Nottingham bound to take a chance on a restaurant that you can’t book for at weekends. We arrived and disappointingly got told there was a two hour wait. At 8pm and with rumbling stomachs we decided to find somewhere else. One quick phone call later and we were heading for Jamie’s. The last time I visited Jamie’s - incidentally my first time of visiting - we had just nipped in for some lunch. After feeling uninspired by the menu and not wanting to fork out quite that much for lunch we opted for a bits and bobs offering, and mix n matched some starters and side. I vowed after that first visit that if I was to return I would need a bit of an incentive so I signed up for the Gold Club (you can do this online on the Jamie's Italian website). Then dutifully forgot doing so. As we wandered in on Saturday the memory of signing up flared along with a loud “Oh, I’m a Gold member!” After a bit of a falter on my part in not having the card on me the fantastic staff took some details, confirmed my membership number then proceeded to reel off what we gain from the Gold card that night. The Gold Card at Jamie’s works a little differently to other memberships where you build up points and get money off. Instead when you visit you get given tasters and little bonuses. Saturday’s were a taster of Scallops and a bonus of Rhubarb and Custard Crumble Ice Cream (I’ll say now – one of the BEST ice creams I have ever eaten). 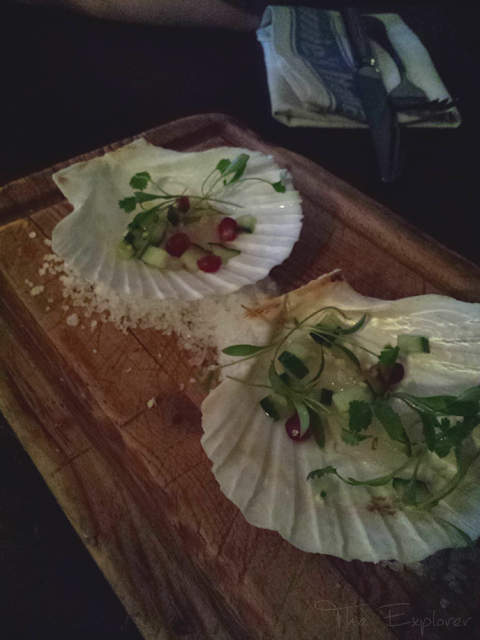 We settled down with some drinks and were swiftly delivered the first of the nights offering: Scallops. Served in shells resting on a bed of sea salt the scallops were nestled amongst cress, drizzled with lemon and scattered with pomegranate seeds. For my first try of scallops I was suitably impressed. 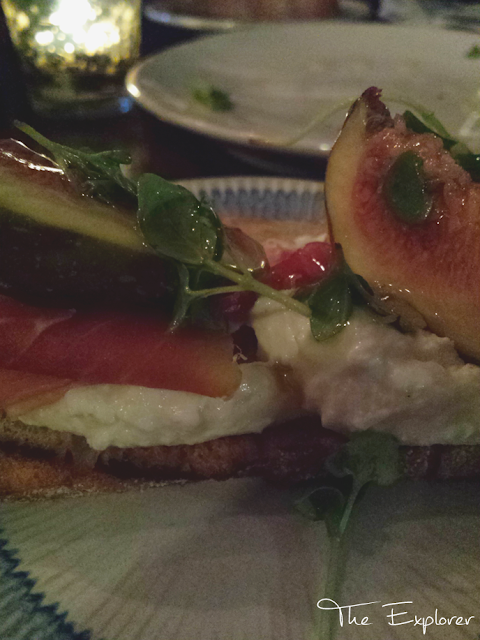 To start we ordered the special to share: Bruscetta topped with whipped cheese, prosciutto, fig and drizzled with honey. It was divine. Lacking in a little seasoning but once amended with a little pepper it tasted every bit as good as it looked. Once the starter was suitably demolished and after a sizeable wait, it has to be said, our mains arrived. I apologise for the photos. Lighting nightmare. 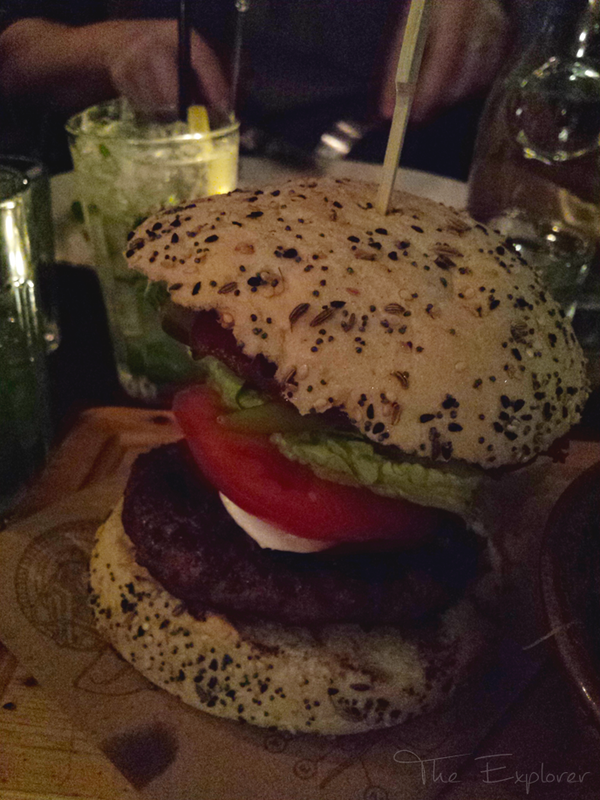 I went for the burger whilst Mr M went for the Turkey Milanese. Naturally I ordered extra chips because who in their right mind has a burger with no chips?! Mr M ordered had to order a side to make a complete meal too. 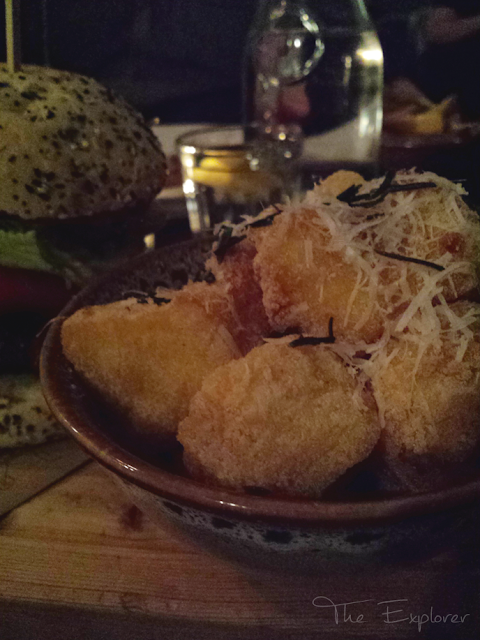 We opted to share the Funky chips (rosemary and garlic, skin on three times cooked chips) and the polenta chips with parmesan and rosemary. All nice but none of them showstoppers. 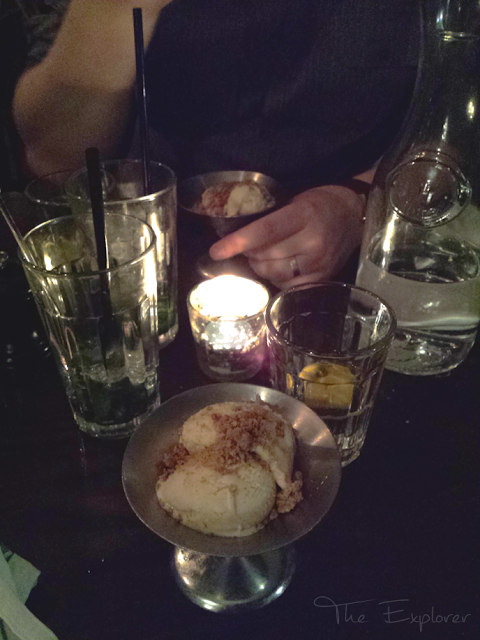 With our mains eaten and our lemonades drunk we decided to end the evening with the ice cream. I was not prepared for what came. This humble looking bowl of ice cream packed a flavour punch. 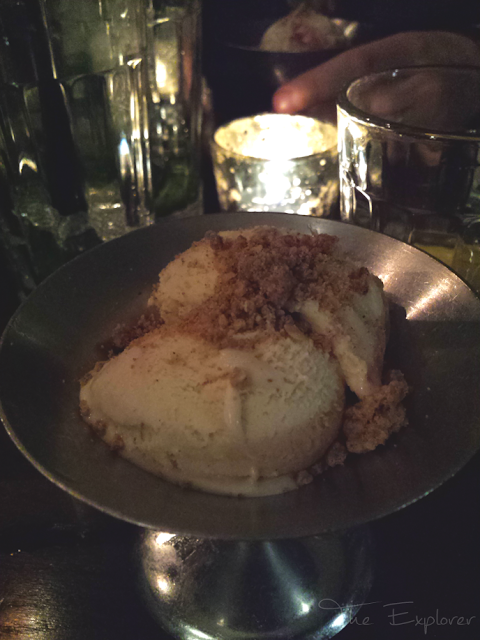 It was creamy, it was slightly tangy, it wasn’t too sweet and you genuinely got a feel of eating a rhubarb crumble. It was, quite essentially, the nicest bowl of ice cream I have had in a very long time! 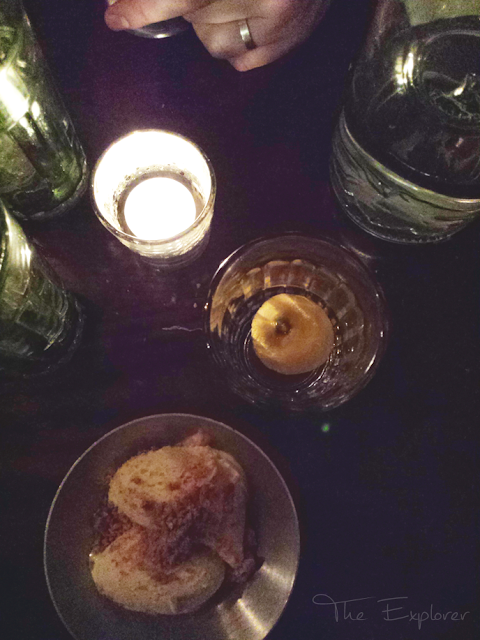 The Rhubarb and Custard crumble ice cream stole the show, and was by far and away the best dish of the night. Pretty impressive for a Gold Card bonus. If you are one of those people that were disappointed by Jamie’s I would highly recommend signing up for the Gold Club. The little bonuses really do make a difference, giving you a few little extras that help to lift the rest of the meal up and you never know when a little extra is going to make all the difference. 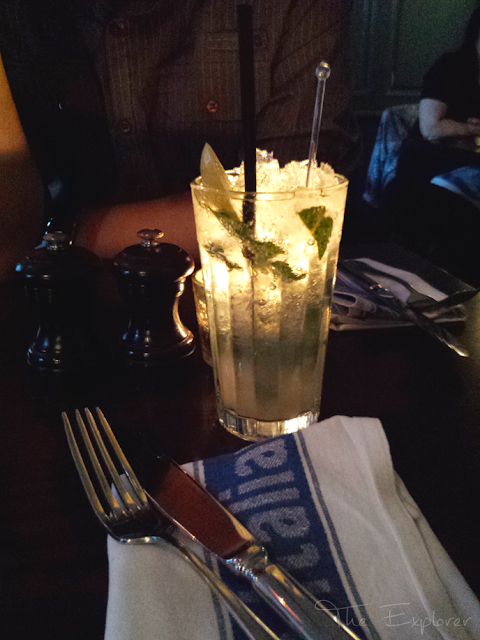 *Jamie's Italian were not aware that I was planning on writing a review about their service. This meal was paid for entirely by myself.